Many educators today are doing their best to move away from the traditional lecture format in their classrooms. This shift is a positive one in order to support student-centered learning. However, there are still times when it is necessary to focus the attention back to the front of the room, whether for a video or a traditional lecture. How do we make sure our students are still engaged even when they are asked to sit and listen? You can create a backchannel in your classroom to ensure their engagement and regularly monitor their formative learning. Creating a backchannel is easy using educational technology. There are a number of tools you can use to create a backchannel, and I offer links to a handful below. So, really, why use a backchannel? Won't that just distract my students? Well, no. Your students are already using a backchannel in your classrooms, whether it is whispering, texting, passing notes, or even jumping on social media. So why not offer them a structured backchannel to refocus the conversation on the content information and give them productive ways to collaborate? Backchannels offer ways to have a more organic conversation with your students. Instead of having students raise their hand and interrupt lecture, they can type their questions in the backchannel. The conversation becomes more relevant and happens more organically. The answers to the questions also become more relevant because you can encourage students to collaborate and help each other out by answering other students' questions. This takes some of the work load off the instructor and puts the onus of learning back on the students, where it really should be anyway. You can use a backchannel on most devices that connect to the Internet, so you can encourage your students to bring their own devices or technology (BYOD/BYOT). As a secondary form of classroom communication, the backchannel is a way for the instructor and other students to clarify and collaborate simultaneously with class instruction. Students are constantly engaged and encouraged to take part in an active discussion. It gives students different options for their voices to be heard. Backchannels are a great use of formative assessment because the instructor is able to immediately see if students understand the content, or if it is necessary to go back over material that students don't seem to understand. Students can also go back to the backchannel after class and use that conversation as part of their class notes, providing another way for them to review the content material. Finally, if you are flipping your classroom, you can create a backchannel that is used asynchronously by your students to continue the conversation. Students are encouraged to challenge one another and answer each other's questions. The instructor can jump in when necessary to clarify any misunderstandings, but the learning and active discussion really falls to the students. Below is a list of popular tools you can use to create a backchannel in your classroom. Many of these tools allow the instructor to monitor and delete responses in real time, allow for class privacy, and can easily be shared as links for the students to access. You can click on the links below and explore each tool individually to get an idea of what would work the best for you and your students. TodaysMeet is probably the most popular tool for creating backchannels in the classroom. You can watch a tutorial video at the bottom of this post. Verso is a great way to create class-specific backchannels for your students. Read more about Verso here. Google slides is a way to present your content material while students type questions in the slide note area. This captures the conversation, and students can use the backchannel within the slides as class notes for studying. Socrative is a great way to visualize student understanding. Padlet can be used to organize information around a specific concept. Poll Everywhere could be used to set up synchronous or asynchronous polls. You could use the Q&A feature to find out what students are unsure about, and then students can upvote items they need clarified. For a Poll Everywhere tutorial, go to this page and click on the logo. Twitter is another way to create a backchannel. The one caution here is that your discussions can be seen by the public. This is a great way to connect with others in your content area though. So create a class hashtag and ask that students use the hashtag in their tweets. Encourage students to tag other people outside of their class as well as organizations and institutions involved in what they are learning to broaden the scope of the discussion. So how do you use backchannels in your classroom? Please leave a comment and let us know! We all want to find different ways to get our students to reflect on their learning. One way to do this is to have students do a quickwrite. You can use this type of assignment as a weekly, in-class exercise, or you can ask students to do this in preparation for class. The quickwrite is designed to encourage students to reflect on the week's content and revisit their notes to review what they learned. It is a way to ask questions about course concepts without having to do a review in class. Quickwrite also helps the instructor to identify areas of review; for instance, if many students mention they are still confused about a concept, the instructor can follow up with review immediately instead of waiting to see students miss certain content questions on the exam. What terms were the most important in this week's content? Define any important terms in your own words. What was the muddiest point for you (what did not make sense)? What would you like to know more about and why? How does this lesson relate to your other classes and/or experiences you've had outside of this class? Why do you think you were asked to learn this content? How does it connect to what you've learned so far this semester? When giving instructions about the quickwrite, be sure to point out that students should focus on the content information and not the operation of the course (i.e., grading). Also point out students should write in complete sentences and answer each question thoroughly. While they may not have an answer for question #2 (great! ), they should definitely have answers for the other questions. You can assign points to each question as a graded assignment, or you could leave it open as a participation and process grade. Choose whatever method makes the most sense for your course and your students. The quickwrite never needs to be a high stakes exercise; instead, it should be a way to ask students to reflect on their learning and give you information on what content needs to be reviewed. Evernote - Your students can create notebooks where they add their quickwrites and then share with you. Google Drive and Docs - Google Drive is a great way to store and share documents. Your students can create their own Google Doc and send to you via email, or you could create a class folder and share with your students so they can share their documents with you. ​OneNote - Similar to Evernote, your students can create their own notebook for your class where they add their notes, assignments, and quickwrites and then share with you. ​Padlet - (formerly Wallwisher) allows users to create their own virtual wall where they may post sticky notes with text, images, or other media. Padlet is good for brainstorming and organizing during the writing process and may be used individually or in groups, either in real-time or asynchronously. Penzu is a free online diary and personal journal. Students can write in their own diary or journal and keep it private or share it with their class. For more writing ideas, check out this list of writing tools! Want to share how you use quickwrites with your students, please leave a comment below! According to the Teaching with Technology survey conducted by Campus Technology (2016), the majority of faculty in higher education are either flipping their classroom or plan to flip their classroom. The flipped classroom is a pedagogical model where traditional lecture and homework are reversed. Many flipped classrooms include short video lectures from the instructor in order to cover content knowledge before students come to class to discuss and practice the content through projects and exercises. The flipped classroom focuses on active, student-centered learning and has shown an increase in student engagement inside and outside the classroom. Flipping the classroom allows instructors to offer more interactive and applied practice to help students reach higher level learning. At its core, flipped learning really is a form of blended learning because it incorporates both face-to-face and online elements. Flipped learning can be used to modify learning to best support students' needs and learning interests. Flipping the classroom will be a change for both instructors and students. Instructors will move away from the Sage on the Stage model toward a Guide on the Side model (though carefully considering what that means and not leaving students to fend for themselves, but instead use their sage-ness to help guide student learning). Students will have more choice and responsibility for their learning. The collaborative and cooperative nature of flipped learning can be uncomfortable at first for instructors and students alike, but supporting students in their learning by offering more hands-on practice is worth it when we see students go beyond basic understanding and instead show mastery of content. Always have a Plan B (or C, or D...) - As we all know, technology does not always work as planned. When technology fails us, it can be incredibly frustrating especially when you are standing in front of a room full of students. Be sure to have a back-up plan that considers both digital and non-digital technologies to support your lesson plan. Don't pick a tool and force it to work in a lesson - Educational technology is wonderful when it supports a lesson in meaningful ways and benefits student learning. However, using technology just for the sake of using technology never works well. Technology should never be a fancy add-on to a lesson; it should be a part of learning that provides students with meaningful, authentic, and engaging learning experiences. If educational technology can help you accomplish something great with your students, then go for it! If you can engage your students better with non-digital technology, that is fine as well. It all comes down to your objectives. Using technology without a specific purpose can lead to lower engagement and lackluster learning. So always consider your content, pedagogy, and technology together (TPACK!!). Check yourself - Always make sure your technology works before trying to use it in the classroom. Check your links and videos to be sure your school does not block the sites you want to use. Each school district and institution has its own policy and filtering system in place. It is good practice to make sure everything works so your students can access the learning materials. Additionally, you should check your hyperlinks within your course before the start of each week since we all know sometimes things on the Internet don't always stay available. Beg, borrow, and steal...don't reinvent the wheel - Before you spend hours and hours designing your lessons, see what is already available out there from other teachers. Most teachers post their lessons online for others to view and even use under certain Creative Commons sharing licenses. You should also check with others in your building to see if you can share materials or design something together. Create a personal learning network (PLN) with social media - Social media is a great resource to reach out to other educators in order to share resources, tips, and tools. Twitter is a great place to start. You can search hashtags such as #educator or #teacher, and be sure to check out the #edtechchat that happens every week! Give students options - Students should have a say in their learning, and educators can give it to them. Use educational technology to give your students a voice. For instance, instead of requiring a paper, give them an option to create a multimedia product presenting their learning. Students will love the opportunity to choose how they present their learning rather than simply being told what to do. Most educators are familiar with Bloom's Taxonomy. Proposed and created in 1956 by Benjamin Bloom and a committee of educators, it is a classification of the different objectives and skills students should learn from specific course content. The taxonomy was updated in 2001 by Anderson and Krathwohl to focus on six levels of learning: Remember, Understand, Apply, Analyze, Evaluate, and Create. As you can see below in the first image, Anderson and Krathwohl shifted the taxonomy from nouns to active verbs. You will often see Bloom's presented as a hierarchical, step approach (either as a pyramid or steps). It is important to note that the learning at the higher levels is dependent on the student having the prerequisite knowledge and skills at the lower levels. So each level can be built on the foundation of the previous levels. However, you can also think of Bloom's functioning at the same time, depending on your learner, your learning context, and your course content. The second image seen below helps educators think of these levels and how they branch out to emphasize and support our different types of learners. Note how each outer circle presents a different way of using the taxonomy levels. You have words that will help you as your write your learning objectives followed by examples of activities you can use as assessments to align to each of your learning objectives. Finally, you have different learning styles connected to all that come in the earlier circles. As we extend our knowledge of Bloom's Taxonomy, we should start to think how we can extend our students' understanding and practice. We should emphasize and support 21st century learning in our classrooms. 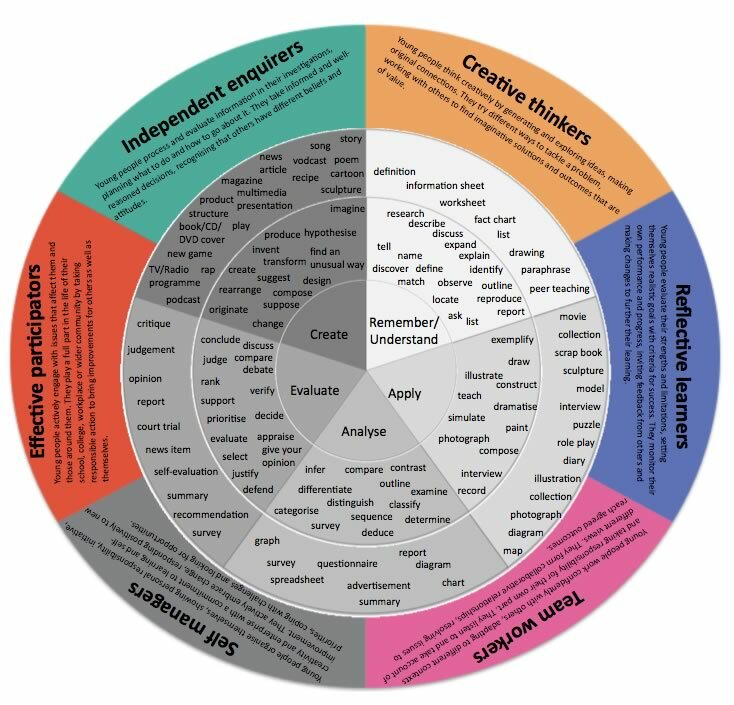 The image seen below helps educators think through digital activities aligned with each level of Bloom's. Note that the activities are simply categories and not specific tools. You have the freedom to choose tools that will support these activities. In fact, ask your students to identify digital tools that would be useful for the activities to increase their buy-in to the learning process. For instance, you (or your students) might choose to use Voicethread as your tool. Voicethread can be used on multiple levels, such as for Understanding, Applying, Analyzing, and Evaluating. It all comes down to what your objective is and what information and/or skill you want your students to learn. Remember, your course objectives should align with your lesson objectives which, in turn, align with your assessments which then align with your evaluation processes. Each lesson objective should focus on helping your students demonstrate the mastery of your course objectives. The lesson objectives directly support the course objectives, and they all should build up the Bloom's taxonomy to help your students show learning mastery over time. Many of us sometimes feel too connected to and distracted by our devices. This is evident in our classrooms as well. Many educators have started to notice, and feel frustrated by, student distraction in the classroom when it comes to devices. Laptops have become ubiquitous in the classroom and have become a focal point for faculty frustration. However, banning laptops and other devices is certainly not the answer. We allow our students to use clickers, cell phones, and other devices for limited purposes in the classroom, such as polling, but we do not necessarily guide our students in how to best leverage these tools at their fingertips. In fact, many educators point to studies on the value of taking paper notes. The argument in the studies is that learning improves when we force our students to write out their notes. This practice requires them to think more deeply about their learning and commit more content to memory. That is a valid objection, as is the argument about how distracting devices in the classroom can be to learning. We have all witnessed students with open laptops with multiple browser windows open that often do not have to do with the class content at hand. While I am not concerned about students who prefer to distract themselves from their learning (after all, they are causing themselves a disservice), I am concerned with the distraction to other students who want to pay attention. This frustration with devices has led many faculty to ban technology from the classroom. The argument is the ban will take away all student distractions. The first issue with such a ban is one of accommodation. We have students who require devices for accommodation purposes, and by issuing a general ban on technology, this can call a much-needed accommodation to everyone's attention. This can make students uncomfortable and may cause them to stop using their own accommodation. Instead, we should embrace technology and teach our students how to leverage technology successfully in the classroom. We need to ban the classroom technology ban. We should use technology as an opportunity to engage our students in different ways of learning. We should use technology to expose our students to new information and ideas. We should use technology to help our students learn to collaborate synchronously and asynchronously. Leveraging technology can help teach our students much-needed skills they will use beyond our classrooms. So what we need to do is set ground rules for using technology in our classrooms. Discuss this openly with students. Create a class contract that includes the appropriate use of educational technology in class. Be purposeful in how you teach with technology. Be purposeful in how you ask your students to use technology. ​Don't ban technology in your classroom. Embrace the opportunity to use technology effectively and support better teaching and learning every day.